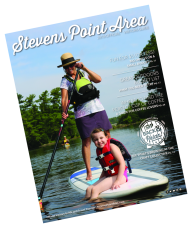 STEVENS POINT, Wis. (January 31, 2017) -- The Stevens Point Area Convention and Visitors Bureau (SPACVB) have named its new board members and officers for 2017. Amy Boston, Hampton Inn, has been named Chair, Pete Theisen, Portage County Bank, has been named Vice Chair, Richard Holden, Village of Plover, has been named Treasurer and Noall Silvester, Holiday Inn, has been named Secretary. Two new board members were elected including, Brad Duckworth, UWSP and Sarah Jo More, The Main Grain. One outgoing board member, Layne Cozzolino, Central Rivers Farmshed, was thanked for her years of service to the Stevens Point Area Convention & Visitors Bureau.